Bolivian Thoughts opinion: Over the last eleven years, we have seen the best possible economic times ever in our whole history, the perfect opportunity to overcome poverty, generate sustainable employment and be competitive. 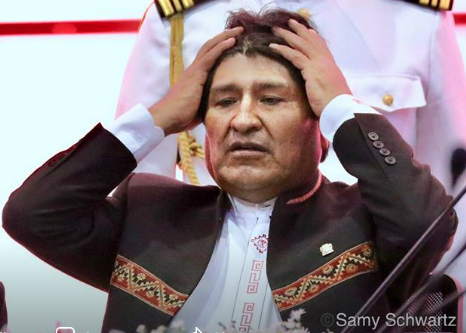 Bolivia was taken by the worst kakistocracy and/or ochlocracy ever thought imaginable! At the bottom, please find a comparison between these two “characteristics” for this government. The President of the Republic, for many reasons he must have, from time to time launches criticism against some of his collaborators who are ministers. He considers that the efficiency and realization of projects must be continuous and does not accept arrears and losses. Many times, in the present government, as it could have happened in many of several decades, it is evident that the ministerial efficiency is not perceived in realizations that are expected, due to difficulties to execute budgets or, simply, due to the lack of planning or the inefficiency of personnel that collaborates, which gives rise to disorders that harm any governmental management. Since the beginning of his mandate in 2006 and which has already lasted for a long time, the Chief Executive surely had to regret misunderstandings that have resulted in little or no efficiency on the part of those who should collaborate efficiently. The truth, although it is difficult to recognize it, is that the shortcomings are due to the fact that institutionality has been ignored, an important factor for the realization of any government program or, even more, for achievements that are considered important. The institutionality not only lies in seeking and achieving the validity of the rules and conditions that make the entities, the submission to laws and specific provisions that must be applied so that there is rational operation in everything and, within all of this, the designation of officials, who can not be left to only friendship or fulfillment of partisan commitments, but to that the elected ones possess the precise capacities, the professionalism due, according to which government portfolio they handle, experiences developed not only in diverse private or public fields but even performances in academic teaching, previous specializations due. In other words, no minister of state or immediate collaborators can be the effect simply of friendship or partisan convenience because, in any circumstance, what matters is whether that official will serve to perform fully, efficiently and responsibly the functions entrusted. National public opinion, regardless of what the opposition has observed at the time, has become aware that the government for good intentions and better purposes to govern, may not always have optimal results if you do not have highly capable ministerial teams , honest and responsible according to the needs of the country; that the political-partisan questions are left aside due to the priority and importance of the affairs of the State. There is much that the President would achieve with properly trained personnel and, for this, he must forget the “finger” designations that, in any case, only cause damages, inefficiency and consequences not convenient for the State or for the government.